Time to hit the bookstore, people! Rachael Ray's newest cookbook, Look + Cook , was released today. 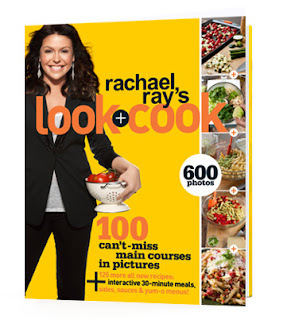 Rachael Ray recently spoke about this new book and said as with other previous cookbooks, she "wanted to keep it in the same price range of a movie or a CD because I consider it 'pop food.'" The difference between this book and any other previous Rachael Ray cookbook is the format. The first 100 recipes all have pictures that detail each step of the recipe, "[s]o you can tell how many pots and pans you want to dirty," Ray said, "how much chopping you want to do, and you can tell if you're in the mood to make the meal." Notably, not all of the meals are 30 minute meals. Even the 30 minute meals section in this book has a gimmick - you can go online and watch video of Rachael cooking each one in real time - no commercial breaks with swap outs, no accusations of little helpers running around making it possible for Rach to finish in 30 minutes! We'll get to see her cooking the recipes from the book and we'll see her make them in 30 minutes. So there, critics. Apparently one of the recipes was a nail biter when Rach was trying to beat the clock: "The Meatball Meatloaves with Spinach-Parm Mashers caused me to sweat a bit." She made it in 28 minutes. Phew. I am looking forward to venturing out of the house, even with a 2 year old and a newborn, just to get my hands on this one. I don't ever order her books online because I love the experience of heading out and taking the new book home! Next week's menu will be full of recipes from Look + Cook , I can promise you that. Let me know if you try out any of the recipes and help me pick what to make!